One of the most overlooked elements of garden design for the average DIY gardener is garden edging. It can be laborious to install, expensive, and lets face it…just plain boring. Landscape edging can create a solid hardscaping base for your garden design to improve curb appeal, and to add structure to your garden and yard during the winter months. Here are some great ways to make your garden edging more exciting, unique, creative and low budget. 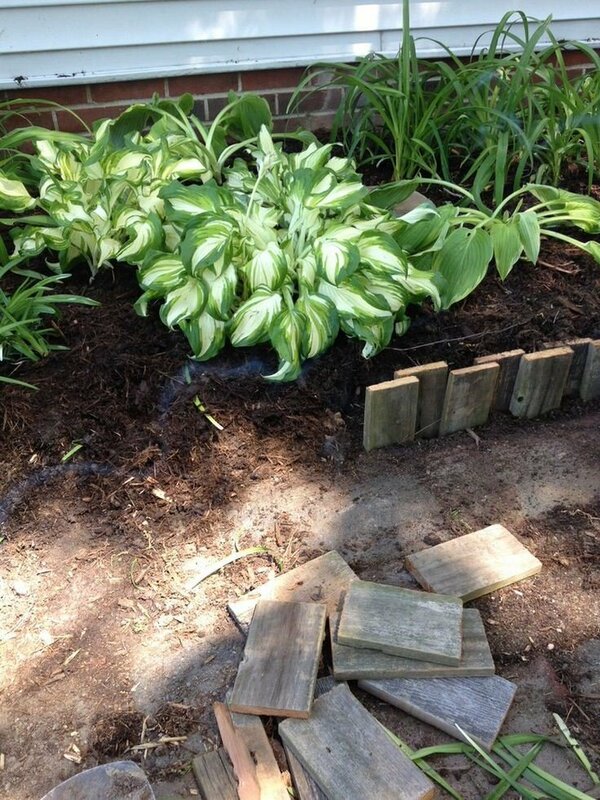 Wood is always an easy material to use for garden edging because it can be easily recycled from old fences, decks, or building reject piles. It can also be easily cut at home, so that you can customize your wood garden edging. 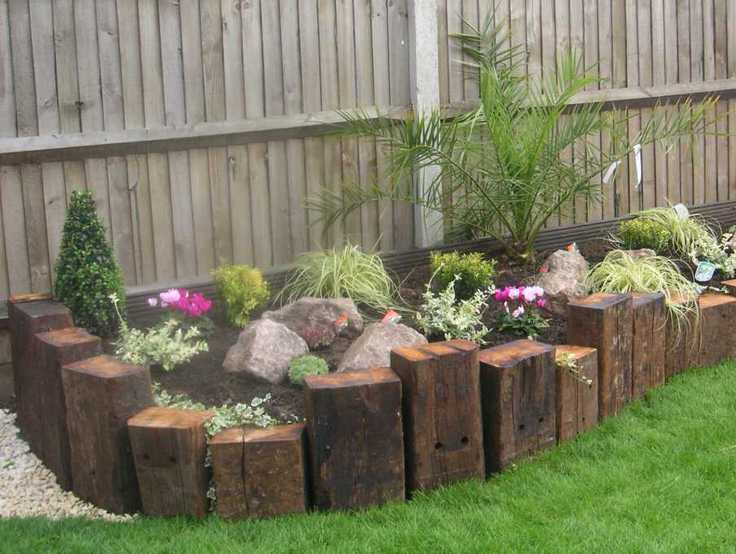 This photo from ‘Kilgraney’ shows how old railway sleepers can be cut into varying lengths and used vertically as a lawn border. You can also use timber landscape edging laid horizontally in larger sections for a straight edged border. This next wood landscape edging idea comes to us from Pinterest with no known source, but we have some easy instructions for you for a similar project next at ‘Farmhouse 38‘! Pallets are a great DIY building material, and with good reason. It’s a renewable resource, that is usually free! Check Craigslist or ask local businesses for their leftover wood pallets. Use the lumber to cut sections of wood, paint some of them randomly and sloppily (for that “vintage” feel) with leftover house paint and leave some unfinished, then dig a trench for your garden edging. Any other scrap wood can be used as well. 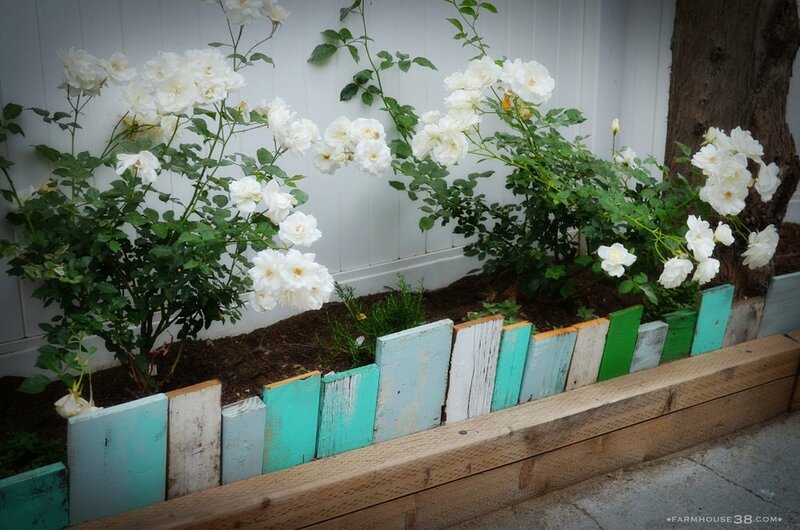 Check out ‘Farmhouse 38‘ and their tutorial for their great scrap wood landscape edging project! Yes, we have all seen stone and rock as a casual garden or landscape edging. And it works, but it can look old fashioned. Instead of just lining up country stones, update the look by digging a trench edging your garden or lawn, then fill the trench with similarly sized rocks and stones. It gives you a good mowing strip, a barrier for weeds and grass, and it looks more modern. You can either purchase decorative rock, or better yet for your budget, collect rocks from your own yard and re-use as edging. Use this idea to inspire you to love that rock in your soil you have always cursed! Photo source unknown. 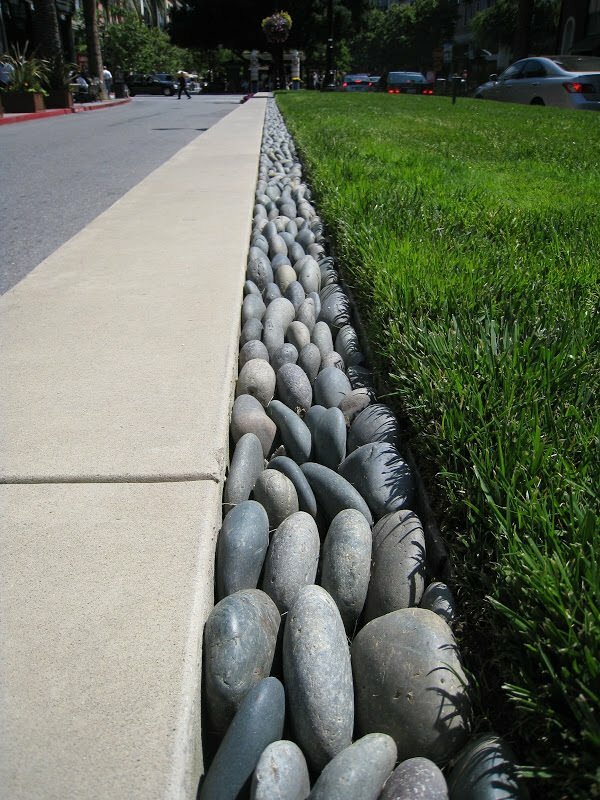 Here is another example of using rock garden edging. Now it looks to us like this is bagged rock bought from the nursery, but you can collect rock from your garden, ask neighbors, or ask at a building site if they have any leftover grading rock they would love for you to haul away. And Craigslist! So many people order too much landscape rock for their project and would be thrilled for someone to just come and haul it away! 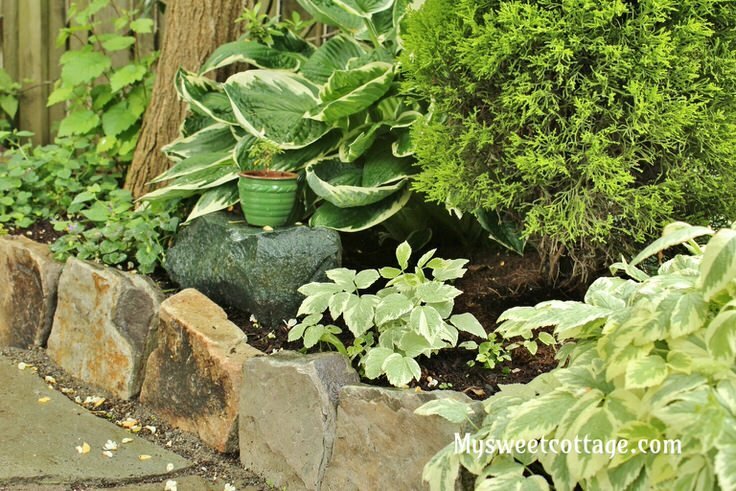 Try this DIY garden edging from ‘My Sweet Cottage‘. They tell you how they made these landscape borders using some sand, a mallet and rocks. These type of rocks are easy to collect as you dig in your garden. Or again, put an add in Craiglist looking for used landscape rock. 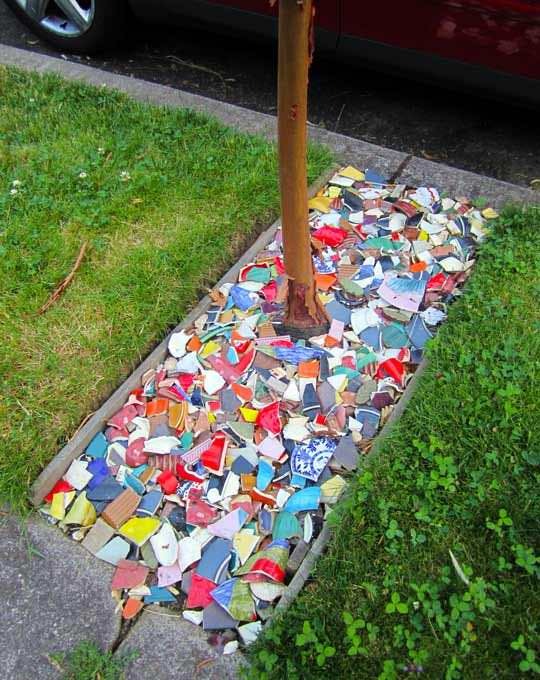 Here is a great way to recycle broken or old dishes, saucers, or even old ceramic pots and planters. You can grow quite a collection from yard sales, thrift stores, or by posting a want ad on Freecycle or a community bulletin board. Break up the dishes into pieces and use in a trench much the same as you would small decorative stone. Place a few dishes at a time into an old pillowcase to protect you from flying glass, wear safety glasses, and take your hammer to it! How small of pieces you want is totally up to you. Keep the size in scale with the size of the trench and garden area. Also remember, larger pieces will give you more texture and color. This landscape edging idea from ‘Apartment Therapy‘ was used more as a decorative mulch, but could be used as garden edging just as easily. 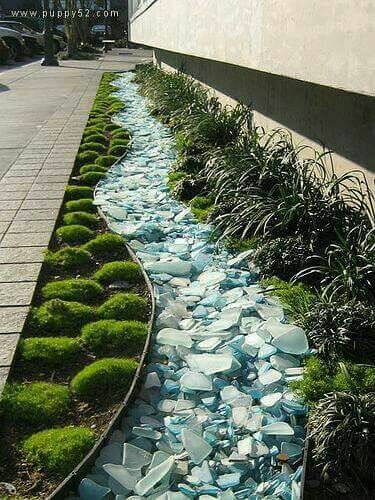 Another idea is to purchase recycled tumbled glass. You can use inexpensive plastic landscape edging or even wood benderboard to keep the glass pieces in place. One of TGG’s fav recyclables is steel and other metals. They blend well into the natural state of the garden, and have a more modern look. Check out your local Habitat for Humanity Re-Store, or yard sales and salvage stores for great ideas. Remember, you can use things that can be partially buried in the ground, like steel pipe sections, or perhaps steel utility boxes or slices of metal pipe that can be laid into trenches, then back filled with gravel. From ‘Floradora Gardens’. Did you know you can buy reclaimed brick (for cheap!) at places like ‘Home Depot’? 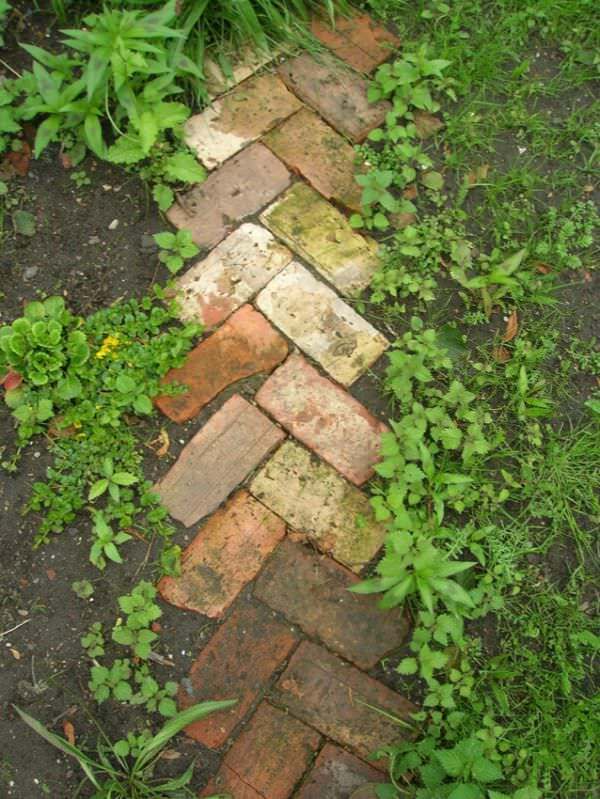 Make the world a better place by recycling an age old material into your garden edging. We love this herringbone design. We suggest digging a trench and laying out your brick, then back fill with soil half way up the depth of the brick. Pack down, then fill the rest of the trench with sand. (To the edge of the brick edging.) Photo from ‘Hometalk‘. 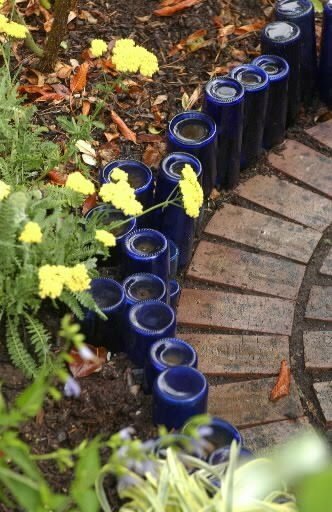 If you haven’t already seen recycled bottle garden edging, it’s time to take a look. This idea is best in areas where there is little traffic from machinery such as mowers. We found this on Pinterest, so we suggest that you cut the bottoms off recycled bottles. You can do that with a simple glass cutting tool you get from the hardware store. 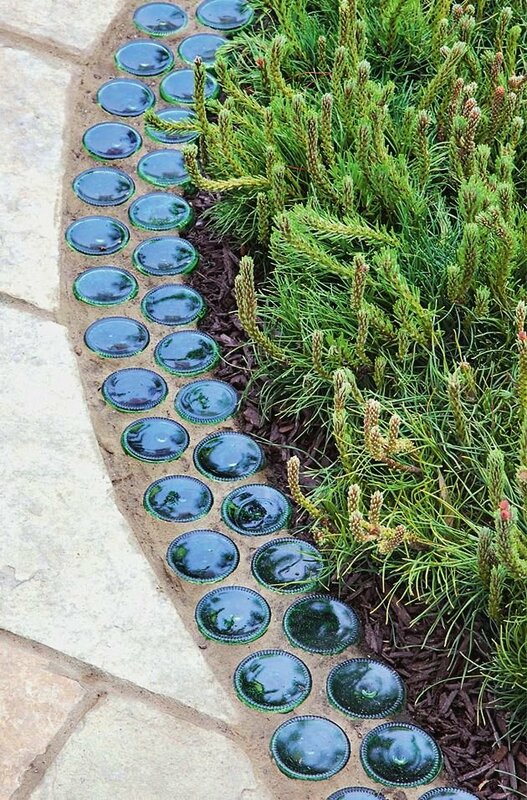 Then fill a shallow garden edging trench with mortar, and press the glass bottoms into the surface until they make good contact. Let set slightly, then wipe off any mortar from the glass. You can bury the bottles neck down so that the bottoms of the bottles provide the edging. You can vary the heights of each bottle, or keep it all uniform. Choose to use bottles of all one color, or mix it up. Photo source: Gregg and Ellis Landscape Design in Portland, Oregon. Or you can take that same idea and make a theme out of it! 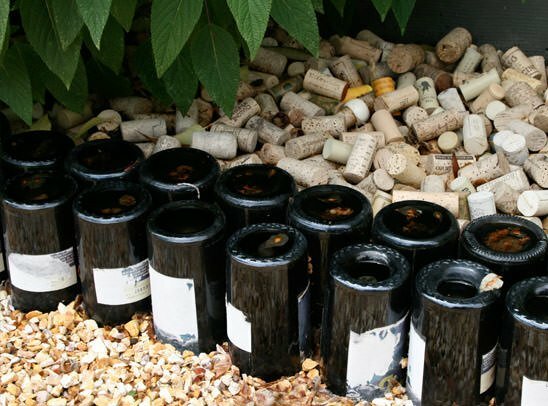 Love this wine bottle garden edging and cork mulch! From ‘Landscape Resource‘. 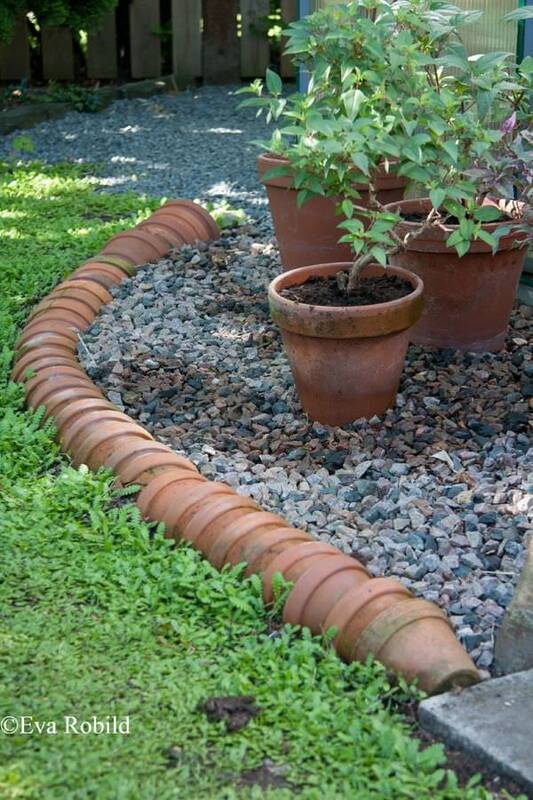 If you are like us, and love a good recycled garden pot, then try this landscape edging idea from ‘Eva Robild‘, a Swedish garden writer. You can ask at a local nursery about buying old terra cotta pots. And it doesn’t matter if they are cracked! 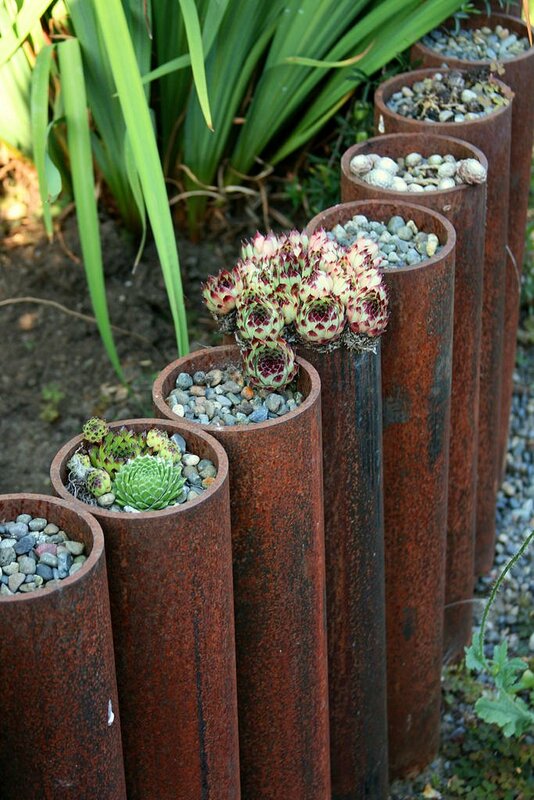 We hope you love these great creative DIY landscape edging ideas for your garden, while recycling and saving cash. We think you will also want to check out our posts on Beautiful and Classic Lawn Edging, and More Creative Garden Edging Ideas! Note: This post has been refreshed with updated ideas. Thank you David for your input! Some of these ideas are outside the box, we would love to hear from you. Thank you Jane for your comment! I am so glad you found this useful.